Bayer HealthCare introduced the Medrad MRXperion magnetic resonance (MR) Injection System at RSNA 2016 after the system received US FDA clearance earlier this year. The full commercial US MRXperion launch is expected to take place in the first quarter of 2017. Bayer’s latest injection system provides customers with tools to improve workflow efficiency in the magnetic resonance imaging (MRI) suite while accurately recording and reporting MR contrast-enhanced procedure data. 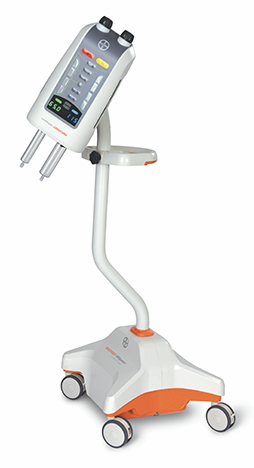 According to the company, MRXperion is the first MR power injector to combine both estimated glomerular filtration rate (eGFR) and weight-based dosing calculators at the point-of-care. MRXperion introduces snap-on/twist-off syringe design with syringe autoloading and priming functions for MR.
MRXperion is Bayer’s first MR power injector that features informatics capabilities through Bayer’s Radimetrics Enterprise Platform to accurately record and report MR contrast-enhanced procedure data. This platform combines contrast analytics when used with the company’s Certegra Workstation and radiation dose management to offer enterprise-wide data capture, cumulative contrast dose tracking and PACS/RIS connectivity. The company also announced the full launch of its U.S. Radiology myORDERS eCommerce website. The myORDERS digital ordering platform — according to the company one of the first of its kind in radiology — will allow customers to place and track shipments of radiology-related disposables, such as syringes and tubing, online. Customers also will be able to use the site to access Bayer’s full catalog of radiology supply offerings. The site will provide customers expanded control over their orders and help limit the potential for human error associated with manual data entry. Bayer Announces US Launch of MRXperion MR Power Injector and myORDERS eCommerce Website. Appl Radiol.